Well, this is shaping up to be a Mercedes day, what with my previous post being about the classic Mercedes 230S. This time the news is a little different: The leader in plutocrat luxury announced its hybrid assault on Japan, the home of the hybrid, on September 3rd. The new hybrid S class is part of a general range make over for the perenial S Class model, with the twist that it also breaks new ground for Mercedes and achieves excellent fuel effiency figures – beating its sibling S350 by 30%. As a result it beats the Japanese 2005 emmissions standards by 75% (gaining a 4-star rating), and even manages to undercut the 2010 standards by 25% (to gain a 2-star rating next year). 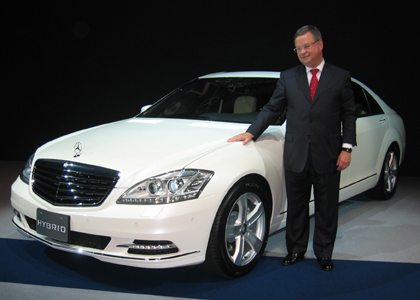 The question Mercedes must be wondering is whether it can beat the Lexus LS600h on its home turf. That will be an interesting battle!